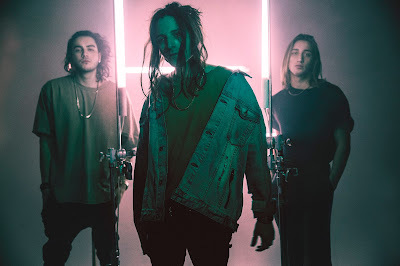 In short, Chase Atlantic are an Australian twisted alt-pop trio now based in LA. After some time away, the band have come back strong with a collection of songs, 'Part One' and 'Part Two'. 'Part Two' begins with the band's debut UK single 'Triggered', a dark cinematic account of a young relationship. Building on the determined rhythms in 'Part One', 'Triggered' features pulsing beats with impatient vocals to detail a highly emotion charged, slightly reckless, drive to a girl's house in the middle of the night. A stand out part of the song is a moment of silence in the middle when you think things have calmed down, only to realise that this is the build up to an even more explosive chorus than the previous ones. Next up is 'Cassie'. This song starts out a little differently to 'Triggered' with a blurry guitar-esque beat leading into the familiar drum pulse. The vocals are more relaxed as string-like sounds enter, providing a smooth transition to the chorus. A beautiful addition to the chorus this time round is a saxophone pattern that really adds interest to the track described as a pop anthem for hedonistic teens. Seamlessly flowing from 'Cassie', the final track of 'Part Two' is 'Why Stop Now'. This track reminds me most of previous Chase Atlantic songs. Clicking, pulsing drum patterns combine with mellow guitars and smooth saxophones to continue the vibes laid down in 'Triggered' and 'Cassie' in a lighter way. With slightly softer vocals and synth sounds reminiscent of The 1975 at points, 'Why Stop Now' is a chilled track that brings 'Part Two' to a perfect end. To find out more about 'Chase Atlantic' click here.